Mix your yeast with the warm water for about 3 to 5 minutes once it’s foamy it’s ready. Add Flour and Salt to your food processor and put on the lid. Add the yeast mix slowly while mixing it in the food processor. Once it has gone around the rim and makes a dough ball add olive oil. If it doesn’t make a ball of dough and is very sticky add more flour. Once it’s ready put dough on a surface drizzled with flour, and form dough into a pizza shape. I like to divide the pizza in half, so I can make it the way I like and my husbands the way he likes it! 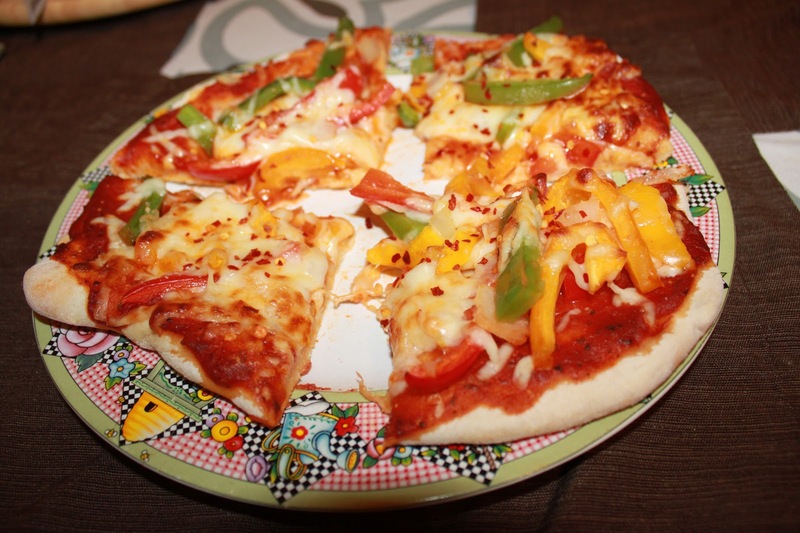 Above I made him a cheese pizza, and I made me a pizza with cheese, peppers and several bell peppers. When pizza is shaped the way, you want it do not add anything yet. Put your pizza in the oven for about five minutes at 400 degrees. Then remove it and add your sauce and whatever topping you want. Put back into the oven at 400 degrees until your cheese is melted, and it has reached the doneness you desire! It sounds delicious!! I love homemade pizza and the kids love helping me make it. This is a great recipe to try with the kids. We LOVE homemade pizza in our home! This looks like a great recipe. I am always looking for new pizza recipes to try. Thanks! Looks really delicious. Thanks for the recipe. I think my boys would have so much fun making a pizza. I need to make one with my boys. Looks delicious! I always make pizza for my kids, but I only use the store-bought doughs. Making it looks easy. I will definitely give it a try. That looks really good. I should try a whole wheat pizza. My kids will eat pizza for any meal of the day! Thanks for sharing a quick and easy recipe. I’ll take a slice please! Nothing beats homemade pizza. We LOVE pizza here! We make it once a week! I think homemade pizza is a a versatile meal that you can easily control – calorie-wise, ingredient-wise and taste-wise. I especially like making them using Alfredo sauce. That looks awesome! We love homemade pizza and make it at least once a week!